Nothing like a Slab Leak to ruin a good day! Your home will settle over time and cracks can appear in everything from the ceiling to the floor slab. Things shift and often, something like a leak in your slab will occur. Sometimes we find that the water line is too damaged for restoration and have to completely replace the lines. 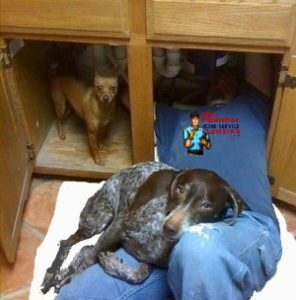 Mr Plumber Phoenix will have you taken care of in no time. We can also provide all flooring, drywall and cabinet repairs if needed after the slab leak is repaired. Every so often a plumbing line re-route is the best course of action for a slab leak. If that’s the case, rest assured Mr Plumber Phoenix can do that too. We are a full service plumbing company utilizing the latest in video inspection technology to detect and locate the damagebefore any work is done. This ensures you get up-front pricing for any slab leak or plumbing repairs. With over 50 years of plumbing experience we get the job done on time, and on budget, every time.